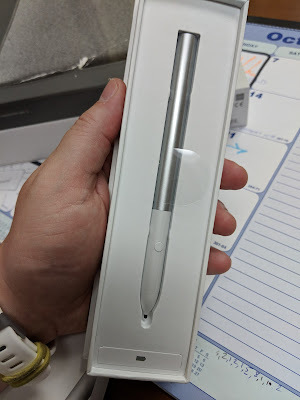 Say that 10x fast… Can I just call it the pixel pen? Way back when, I remember just loving, nay needing, a stylus in my device. I had to have the Note 2 after have reviewed it (my old review ... can't believe that was 5 years ago). I had to have the Note 8 as my tablet (this review was over 4 years ago), it was one of the few devices I'd reviewed that I ended up purchasing one for my own. Yes, the Note 8 was a tablet before there was a Note 8 phone. Anyways, the tricky part about getting those stylii was the fact that as much as I WANTED them when I got it there was very little ‘use’ for them. Sure they were neat and people liked seeing them but it was hard to justify pulling the pen out for what I wanted to do. Oh don’t get me wrong, when there was a specific need for it, it was VERY awesome. The first thing you notice that getting the device out of the box that there’s an actual battery. With any of the other Stylii out there you haven’t had to worry about that. Not sure how I feel … calm that I can replace it, but … how long will it last? 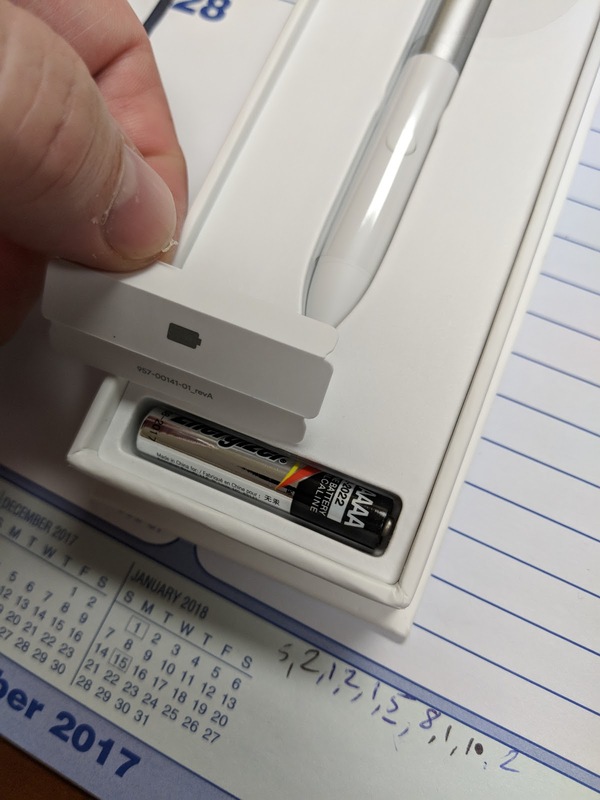 Will I get a notice if the battery gets low? Apparently, folks are saying a battery should last you about a year. But, how do you really know that year is getting close or not? I think I've only ever really used the button to help 'pair' it with the laptop. Most likely you’re just going to be using the pen for interacting with your device as if it’s your finger. Pointing, scrolling. But you can also use it for writing. Personally, I really liked how you can bring up a Google Keep writing note from the lock screen (I wish it would start a new one … but I can see the value). There’s some limited use that you may want to use it for drawing … annotating on a document etc… it’s pretty niche, but super awesome when you can do it. The other way I find it can be used is for screen grabbing or bringing up the assistant. Essentially you can control what part of the screen is to be screen grabbed. To further upgrade it’s superpower there, Google Assistant can be used to analyze what it just grabbed. Instead of doing a “what’s on my screen” you can narrow that search to just what you isolate with the pen. Ah-hah... that's what the button is for. But holding the button while drawing on the display you bring up the Assistant option (instead of having to tap the pen icon in the tray, and then selecting the assistant option). Depending on what you’re using the device, as a whole, for … you may use it a lot. I can see a lot of people using it just as a fancy finger. 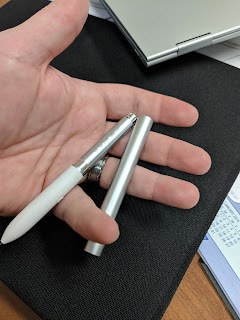 Keep in mind that you can bend the device around and use it like a tablet, so it makes using the pen look a little less awkward. So, is it worth $129CDN? Well, that depends on your usage. For me, I plan on bringing this tablet EVERYWHERE. So, as such, I’m going to want to be able to have it do a lot. It was expensive, so for an extra few bucks, I can have it ready for anything I can throw at it. It’s better to have it and not need it, versus needing it and not having it. I just wish there was a better way to carry it about. With the Tab S Pro (link) there was a little holder that stickered to the case. There is a holder in the Sleeve (review on that later) but it’s not so comfortable. You don’t want it rolling around at the bottom of some bag, or leave it in your pocket. How durable is that pen tip? In any event ... It's a great addition to your investment, just make sure you don't lose it.